Florida schools could get more money to upgrade classrooms, purchase new computers, tablets and other technology and train teachers and staff how to use them. But they’ll have to meet new goals set by the Florida Department of Education, submit annual technology plans and document how they’re spending the money. That’s according to a bill supported by House Speaker Will Weatherford and Senate Education committee chairman John Legg. The two Tampa Bay-area Republicans plan to introduce the bill today. Legg said the bill is the start of a long-term shift to permanently fund school technology needs. Lawmakers have required half of all classroom instruction is delivered digitally by the time school starts in 2015. Gov. Rick Scott set aside $40 million for technology in his budget recommendation, and lawmakers want to spend at least that much when they begin writing the next state budget in March. 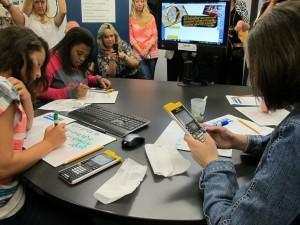 Sarasota County schools partnered with the Gulf Coast Community Foundation to upgrade middle school math and science classrooms. School districts will have to measure what kind of effect the technology has on students. That includes test scores and passing rates, but could also include attendance, discipline and other measures. Lawmakers said the big goal is to better prepare Florida students for future jobs. Both district schools and charter schools would share the money. Legg said technology will be a regular part of the state budget going forward. The bill asks the Florida Department of Education to help school districts with their technology plans. The decisions would be left to the districts, but the state agency would provide advice for online assessments, bandwidth and other infrastructure and devices. Another focus of the bill is training for teachers and administrators to make sure schools get the most out of the devices. “One of the worst things we can do is provide the technology and the digital tools and our teachers not know how to implement them in the classroom,” Legg said. “And it’s more than just know how to work an iPad or know how to work a computer. It’s knowing how to integrate the content into a digital format.